No song of the week today. I’ve got a headache and music would do nothing to solve this problem. 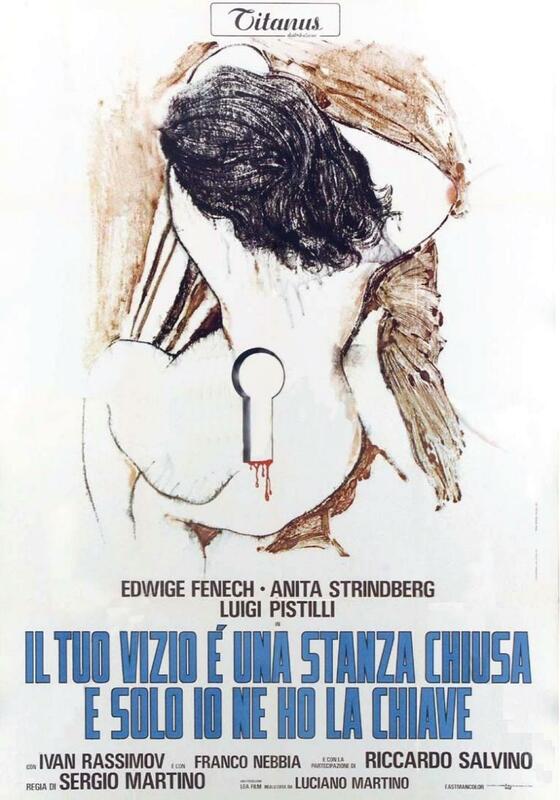 Instead, I’m choosing today to write about a recently revived interest of mine: giallo. I would have found specific, Italian type of horror movie if it hadn’t been for Scream. After I saw that movie in theaters back in 1996, I read a review that mentioned that the infamous opening sequence — Drew Barrymore, video night, Jiffy Pop, phone call — referenced the film Suspiria in some way. I rented Suspiria from the only video shop in town with. Sure enough, I saw the connection: Drew Barrymore, insides out the outside and strung up in a rope swingset, was clearly positioned to look like the unfortunate girl form the opening sequence of Suspiria, who also had outside insides and who also ended up on the wrong end of a rope. Perhaps none of these can hold a candle to What Have You Done to Solange?, but this list as a whole strikes me as even funnier than my list of accidentally hilarious manga titles. Completely random and off-topic query: If someone were to refer to God or Christ in an essay as "him," would it be proper/correct to capitalize the word to "Him"? Like, in an MLA sense specifically, but what's the newspaper world have to say about that? I figured you'd be the one to know if anybody does. Also: Sinful Nuns of St. Valentine is so going into my queue based on title alone. I wouldn't capitalize it. I've written for both AP style and Chicago style, and I don't think either one buys into faith-specific customs about how to refer to Mr. G. I mean, it's kind of blowing your objectivity, you know? So, no, we don't capitalize "him" and "he" and we don't do the Jewish thing where you write "God" and "G-d." But I don't know if you're supposed to be objective with MLA. Are you? A few good ones that you missed are What Are Those Strange Drops of Blood Doing on Jennifer's Body? and Five Dolls for An August Moon. I myself am partial to The Iguana With the Tongue of Fire. Delia: Thanks! These are great. If they're Netflix-friendly, they're going to the top of the queue. Bri: One more thought. If you're gleaning for Netflix possibles, let me heartily recommend Profondo Rosso, Seven Blood Stained Orchids, and What Have You Done to Solange? straightaway. They're great. The rest of them I can't vouch for. The sequel, I Know What You Did to Solange Last Summer isn't very good, though.